As this seminar is likely to be over-subscribed can you please e-mail Sean Hamil ats.hamil@bbk.ac.uk to confirm you will be attending. Article 17 of the FIFA Regulations on the Status and Transfers of Players (October 2009) deals with the issue of the consequences of terminating a contract without just cause between a football player and a football club. In particular it seeks to set out the framework within which the compensation figure a player must pay if they breach their contract will be calculated. The Regulations on the Status and Transfers of Players are themselves a response to an assessment by external agencies, notably the European Union, that the football industry regulations governing the football player transfer market unreasonably affected players “freedom of movement”; they are aimed at ensuring a significant degree of contractual stability between players and their clubs. The Court of Arbitration for Sport (CAS) was established by the International Olympic Committee (IOC) in 1994 as an arbitral jurisdiction for dealing with international sports-related disputes and is now the primary international legal forum for the resolution of specifically sporting disputes. There have been two key cases at CAS in the development of case law regarding Article 17 – the Webster case (January 2008), and the Matuzalem case (May 2009). Both cases have seen the clients represented by Juan de Dios Crespo, Andrew Webster and Shakhtar Donetsk football club respectively, emerge victorious. The Webster case revolved around the attempt by Scottish player Andrew Webster to end his contract with Edinburgh club Hearts and move to Wigan Athletic in the English Premiership. The CAS ultimately decided that he need only pay £150,000 compensation to Hearts and the case was widely viewed as signalling a dramatic increase in the power of players to terminate contracts and move to new clubs. The decision was widely criticised by representatives of football clubs but welcomed by players’ representative organisations. In May 2009 the Court of Arbitration for Sport (CAS) rendered its decision in the case involving the Brazilian football player Matuzalem Francelino da Silva, Ukrainian club FC Shakhtar Donetsk, Spanish club Real Zaragoza SAD, and the world governing body of football FIFA, following the decision of Matuzalem to terminate his contract with Shakhtar Donetsk and join Zaragoza. The CAS determined that an amount of €11.9m be paid by Matuzalem to Shakhtar Donetsk as compensation for a unilateral breach of contract. The Matuzalem case ruling has been widely viewed as shifting the balance of power back to football club employers from the players in the matter of players’ ability to end their contracts and move to new employers. But the lawyer for the victorious parties in both cases, Juan de Dios Crespo, argues that this is to misunderstand the implications of both rulings. In this lecture Juan de Dios Crespo addresses the following key questions: (1) Is there really a contradiction between the outcomes of the Webster and Matuzelem cases, or are their specific elements to the breach of contract in each case which make it difficult to generalise a trend in similar cases going forward? ; (2) What can be expected from CAS in future cases of this nature going forward? ; (3) Is it necessary to re-modify Article 17 in order to clarify the landscape around the player termination of contract issue going forward? Juan will conclude by giving an assessment of how he sees the future development of case law in the application of Article 17 of the FIFA Regulations. Juan de Dios Crespo is one of the Partners of the Ruiz Huerta & Crespo, one of Spain’s leading sports law firms. He is one of Europe’s leading specialists in sports law and the application of EU law. Juan de Dios has been involved in several of the most important sports litigation cases of recent years (Mexès;Rodríguez/Bueno; Granada 74; Webster; Pizarro; and most latterly Matuzalem). He is an Arbitrator of the Valencia Chamber of Commerce as well as in proceedings at the International Chamber of Commerce (ICC) International Court of Arbitration in Paris. He is also President of the Sports Law Section of the Valencia Bar and a regular speaker at legal and sports business seminars. He has published numerous legal papers. 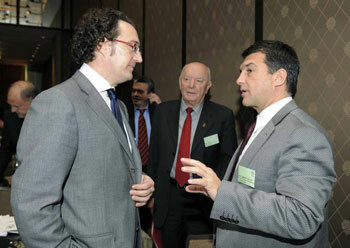 Juan de Dios in conversation with FC Barcelona President Joan Laporta following Juan’s lecture to representatives of the 95 European Club Association (ECA) members and UEFA representatives at their meeting on 10th February 2009 in Geneva (Switzerland). The ECA, the official organisation representing major European football clubs (recognised as such by UEFA), invited Juan to its First Annual Conference to speak about the cancellation of the footballers’ contracts by virtue of Article 17 of the Regulations for the Status and Transfer of Players (“From Webster to Matuzalem and the future of Article 17”). This lecture presents an update on that address. An interview with Juan de Dios Crespo in May 2009, where he discusses the implications of the Matuzalem case outcome, can be accessed on the www.iusport.co.uk web site.